And as you can see from the screenshot below, I'd say my quick and dirty test seems to have gone well. 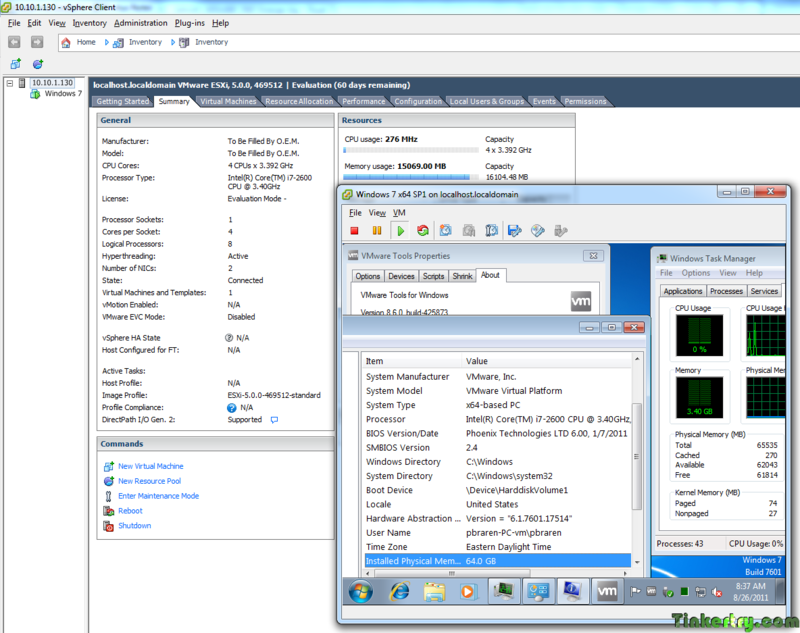 No special tricks, just a default "Typical" virtual machine running Windows 7 x64 SP1, created from scratch install from ISO file, and allocated 64GB of RAM (I only have 16GB physical RAM), installed VMware Tools and rebooted. So apparently the limitations are with licensing (vRAM Entitlements) and physical memory, nothing to do with technical restrictions with VMs. So I'm really just mentioning that for testing purposes, you are allowed to tell a VM you have 64GB of RAM with the free Hypervisor, even if you only have 16GB of RAM. At least for now, I don't have access to any systems with more than 32GB of physical RAM for a real test, however.